Charles de Tornaco came from an aristocratic Belgian family which included a former prime minister. He started racing in 1948 with his best friend Jacques Swaters. 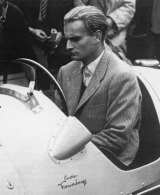 in a car he owned, and Swaters subsequently set up the Ecurie Belgique team (the name was soon changed to Ecurie Francorchamps) to support de Tornaco's ambitions. In 1952 the team entered the World Championship as regulations were changed to favour Formula Two cars. de Tornaco finished seventh at the Belgian Grand Prix and in a HWM fourth in a non-championship event at Chimay. While practising for the Modena Grand Prix that autumn he rolled his Ferrari and with almost non-existent medical facilities at the track he died on his way hospital.